6a Fore Street and other buildings some time before demolition. How many people can recall the time when a new pair of shoes became a necessity, and the trip to the shoe shop was an ‘event’? I am, of course, remembering the 1940/50’s when I was a lad growing up in North London at a time when there were no supermarkets where selected pairs of shoes could be tossed into a trolley with the weekly foodstuffs. 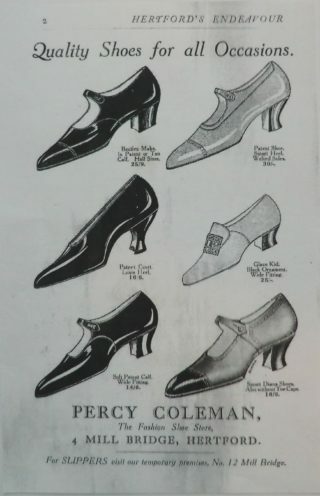 My particular recollections are of attentive staff carefully measuring my growing feet and – the most interesting bit – of sliding my feet into a X ray machine – then common to Lilley & Skinner – and seeing the bones of my feet surrounded by a pattern of tingles (small nails) being part of the new shoes. After careful consideration, my Father would then pay the bill, tendering two £1 notes and receiving one penny change. Not a lot to pay, one might think today, but quite enough for a working class family in those days. 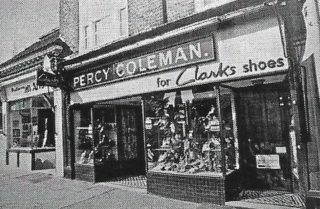 One such shop in Hertford was the family business of Percy Coleman, fondly remembered for serving the community for a little over 75 years. 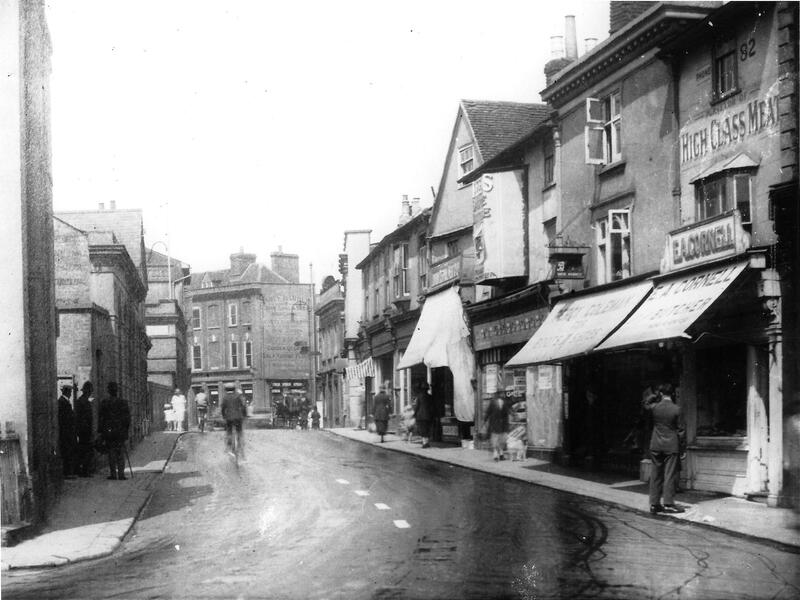 The story begins on 12th May 1912, when Percy set up shop at 6a Fore Street. 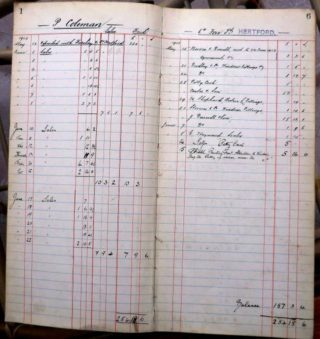 The first entry in the business ‘cash book’ shows an initial deposit of £220 into Barclays Bank , which was then only a short step away in Fore Street. 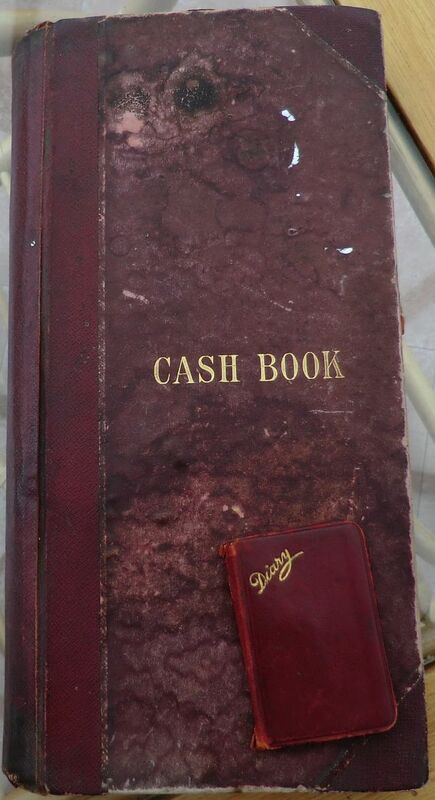 Before opening for business on 1st June, many matters required attention and the first ‘cash book’ entry under ‘expenditure’ shows a payment of £2:2:6d to Norris & Duvall for rent to 24th June. Other payments were for fitting out, electrical work, and likely a payment to a supplier for initial stock. 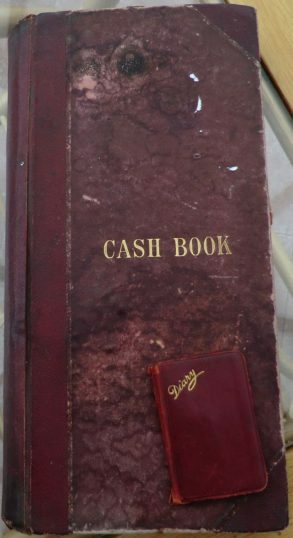 The first week’s trading looked encouraging although, some years later, it was an open secret in the family that, at the very start, many shoe boxes on display contained no shoes – this to disguise an initial reluctance to commit too much capital to stock. World War 1 came and went, and the mood of the community was, of course, to have a fitting war memorial in the Town and this meant a move for Percy Coleman and his business. Sufficient space for the memorial setting as it is seen today was purchased by Sir Edward and Lady Pearson of Brickendonbury and given to the town of Hertford, after which a number of buildings were required to be demolished, including 6a Fore Street. The completed war memorial was finally unveiled on Sunday 6th November 1921, standing upon which was then – reputedly- the very first traffic roundabout in Britain. 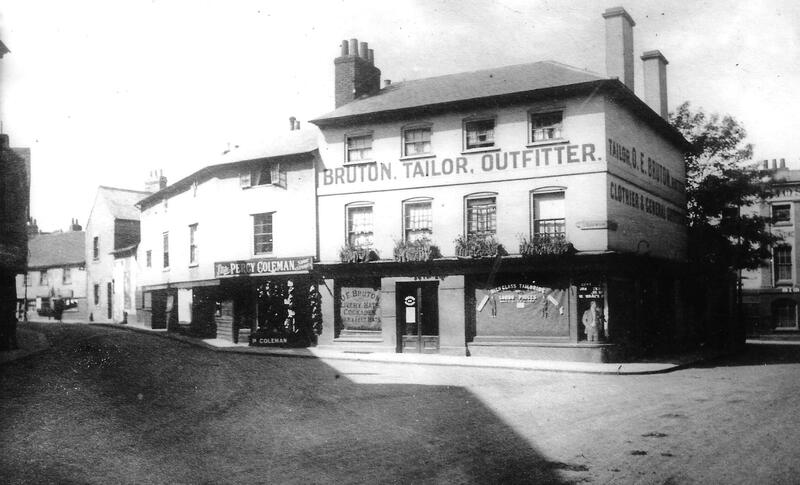 In the meantime Percy had secured alternative premises by purchasing land from Benskins Brewery at Mill Bridge where, due to a much needed road widening scheme, the then Britannia Bar public house had to be demolished. Business grew at 4 Mill Bridge from, originally, mainly mens’ and agricultural footwear to later include childrens’ shoes and ladies’ quality fashion shoes. An advertisement contained in a Christmas Festival guide for shopping in Hertford dated December 1927 shows the sort of goods available – at prices never to be seen again. The success of the business was due in no small part to the loyalty of four lady part-time staff- Irene, Gladys, Elsie and Margaret – who invested a total of 50 years in a job they enjoyed. In 1987 the business celebrated its 75th anniversary, which was marked by a feature in the ‘Mercury’. 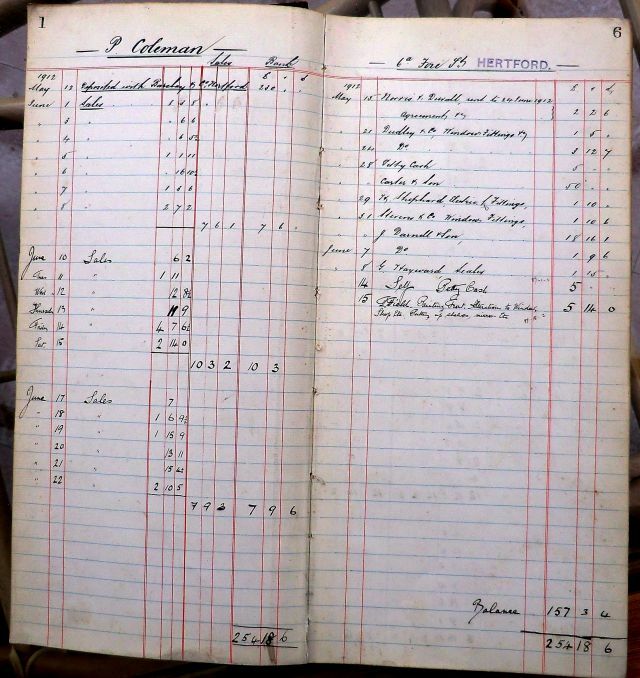 The business had by then been in the hands of Percy’s son, Dennis, for some time. Just a year and a half afterwards Dennis, then aged 68, decided to retire and put the business up for sale. By then ‘high street’ shoe retailing had gone through its evolution, the results of which we see today, and no takers could be found to purchase as a going concern. Consequently the family business was closed down and the premises sold to a new user. Even after almost 30 years people can still be found in the locality who recall the shoe shop of Percy Coleman with affection. I should like to express my gratitude to Ann Coleman, widow of Dennis, for her assistance and allowing me access to material in connection with the business. This page was added on 05/11/2018. 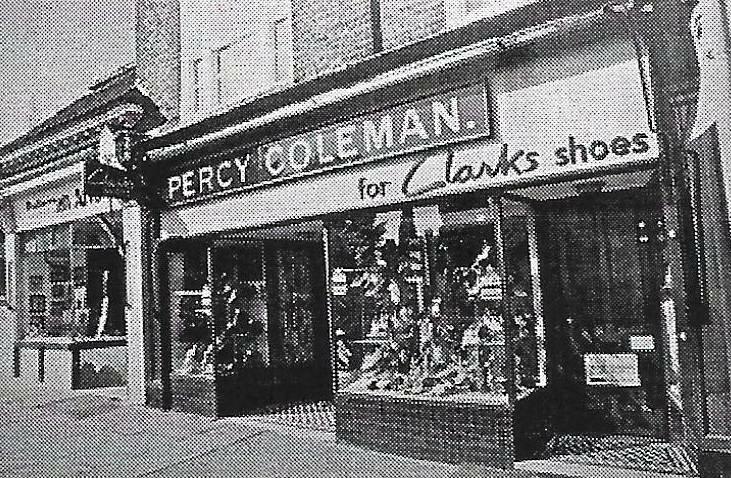 I was very happy to find this page regarding, “Percy Coleman”, the shoe shop right next to Mill Bridge, Hertford. As a young schoolboy, aged about 13 to 14 in 1967/8, I used to work at the shoe shop, one evening in the week directly after school, assisting by clearing & tidying up, burning the rubbish behind the shop directly beside the river Lea, and also running errands, going to the Post Office and purchasing a sheet of postage stamps, and if I remember correctly, at that time, the daughter from the Coleman family attended Simon Balle School too. I was paid 10/- for my labours, but it felt like a million Dollars, I actually had money “on the hip”, and it felt great. Ahhhhh, such happy and carefree days…!